Looking for a quick and easy way to share reminders with other people? Here’s how we do it. My wife and I share a Reminders.app list called Groceries that we check on the way home. If there is anything on the list, we pop into the shop and pick it up. Reminders.app is an Apple app included in iOS and the Mac that enables you to create lists, set reminder dates or reminder locations. It syncs via iCloud so reminders on any device are automatically distributed to all your other devices. 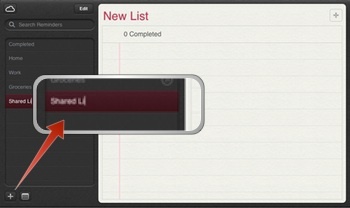 But, did you know that you can also share reminder lists between accounts? That’s how we share our groceries list between our separate accounts. 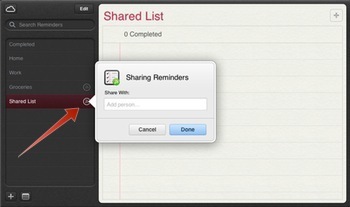 To share a list, start by logging in to your iCloud account at www.icloud.com and click on Reminders. If you need to create a new, shared list, click the + at the bottom-left and name the new list. I just created Shared List. You could also, of course, share an existing list. Then, click on the circular icon to the right of the list name to open the sharing dialog. Type in the email address of another iCloud user, then click Done. Note: You need to use the same email that they use when setting up iCloud on their devices. Apple then sends an email that invites that person to share the list. Once they accept, the icon on the sharing dialog next to their name turns green and the data appears on their devices. Whenever you add or change something on this list, it will now replicate to all your devices and all of theirs too. They can change the list too, and you will see their updates on your devices.